All the plants are labelled, so you know what you’re looking at and you can enjoy the garden simply by walking around and soaking it all up. However, there are some free tours too. The Botanic Garden Audio Trail is suitable for general visitors and is narrated by author Philip Pullman. It features extracts from the “His Dark Materials” books as well the Botanic Garden staff talking about their favourite plants. If you prefer a more specialist approach, there is also a free audio tour which focusses on the Chemistry in the garden. For children, ask for a Big Botanic Backpack which helps turn your family into plant hunters. If you love the British TV detective ‘Lewis’, then the Botanic Garden is one of the many locations in Oxford where a dead body has been found. In fact, one of the murder suspects was the keeper of the garden! Your ticket for the Botanic Garden will also give you admission to Harcourt Arboretum on the same day, so you can get two garden attractions for the price of one. The Arboretum covers 130 acres of land containing the best collection of trees in Oxfordshire with some of the oldest redwoods in the UK. There are also wild flower meadows, rhododendrons and bluebell woods. However, Harcourt is about 5 miles outside Oxford on the A4074, so if you want to get the use out of your ticket, you will need to plan ahead. If you can’t get to Harcourt, we feel the admission price was about right for the Botanic Garden alone. 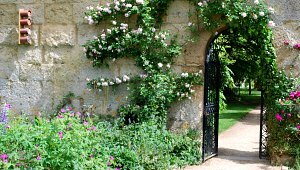 The Oxford Botanic Garden is open daily from 9am, closing at 6pm from May to August, 5pm in September, October, March & April and 4pm from November to February. Adult admission is £4.50 (2013 prices). The Botanic Garden is located next to the River Cherwell in Oxford city centre. The entrance is opposite Magdalen College.